Take in the full MIC experience and join us in the 2018 MIC Pavilion! 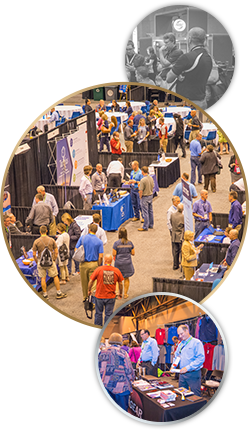 As the hub for the week’s events, the Pavilion is home to not only the NISC Consulting booth and Innovations Lab, where you can chat with NISC Subject Matter Experts, but also the MIC Partners and Vendors showcasing a variety of solutions and services valuable to your organization! Be sure to join us on Monday evening in the Pavilion as we kick off the 2018 MIC with a special Welcome Reception. Hors d'oeuvres and drinks will be served, and you will have an opportunity to mingle with fellow NISC Members before classes are underway. In between sessions and looking for a place to well, chillax? Stop by the official MIC Chillax Room to unwind and recharge (literally, recharge your devices here!) This space is also home to the Internet Café where you can easily check email and flight information and print your boarding pass via our complimentary printing stations. On Tuesday from 4 to 5 p.m., head back to the Pavilion for a special reception with our 2018 MIC Partners. Learn how they can help add value to your organization while enjoying snacks and beverages after a long day of learning. Did you know that NISC’s subsidiary company, iGEAR, can help your organization with not only logoed and flame-retardant apparel, but also with gifts and items for your Annual Meeting? Stop by the iGEAR booth in the Pavilion to learn about the latest and greatest products iGEAR has to offer! Don’t forget to pick up your special 2018 MIC gift, located at the gift table in the Pavilion!